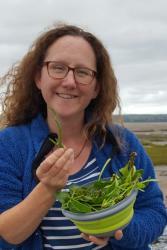 KESS PhD student Liz Morris-Webb, after a successful forage for some tasty coastline plants, including glasswort and sea purslane.Liz Morris-Webb, a researcher at Bangor University’s School of Ocean Sciences is looking for people who gather from the seashores of Wales to take part in her research. If you forage for food, bait, money, education, medicine, research or something more unusual, you can take part. 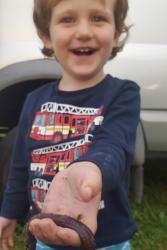 The thrill of the find is something shared with participants from 3 to 83. “It would be a shame if these historically important species or activities were lost. So I am attempting to understand the meaning of this very traditional activity to the modern seashore gatherer” finishes Liz. If you gather from the seashore have a go at her questionnaire to think more about why you gather in an ‘Age of Consciousness’, when most things you want are only a click of the mouse away. Take at https://bangor.onlinesurveys.ac.uk/what-does-gathering-from-the-seashore-mean or contact Liz to arrange a personal interview. Liz Morris-Webb’s research scholarship is funded under the Knowledge Economy Skills Scholarships (KESS 2) programme, a pan-Wales higher level skills initiative led by Bangor University on behalf of the HE sector in Wales. It is part funded by the Welsh Government’s European Social Fund (ESF) convergence programme for West Wales and the Valley and is part funded by company partner Marine Ecological Solutions Ltd. (Marine EcoSol). www.marine-ecosol.com Both the Research Masters and PhD elements are integrated with a higher-level skills training programme, leading to a Postgraduate Skills Development Award. KESS 11 will run until 2022 and will provide 600+ PhD and Research Masters opportunities across Wales.